These magazines and newspapers often rely on advertising to stay in business but don’t be led up the garden path by thinking that you have to advertise in order to get any editorial coverage. If you have a genuinely interesting or newsworthy story, you should send a press release with the details. Have a look at the magazine. What other stories have they published? Who were they from? What kind of details were included? Have you launched a new product, created a new service, employed a key member of staff, had a significant business birthday, moved premises, invented a new way of working, taken part in a charity event? All these things might generate a bit of coverage in the right publication. It’s worth a phone call to establish who might be the best person to send it to, and to check their contact details. It’s also a good way to establish some rapport before your email appears. 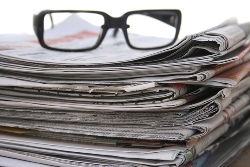 I’m not suggesting you’ll make the front page of the national press, but even if you simply appear in the news section of your industry trade press, you will be getting free publicity and can start to build up a collection of press cuttings. Provide results – what happened, what’s likely to happen, what’s the outcome? Just give it a go – you might be surprised at the results.